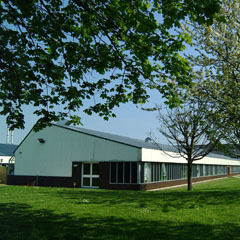 Originally part of the Poultry Research Centre (PRC), from 1987 this site was home to the newly-formed Edinburgh Research Station of the Institute of Animal Physiology and Genetics Research (IAPGR). In 1993 the Station, now known as the Roslin Institute, became world famous following the birth of Dolly the sheep in 1996. It also became the headquarters of PPL Therapeutics, the biotechnology company established to commercialise the Institute’s scientific research. This site is now under development for housing following the Roslin Institute’s relocation to the Easter Bush campus in 2011. 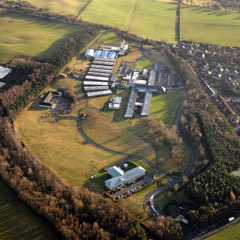 The original site of the Roslin Institute from the air.